After 14 years of planning and construction, Ronald Reagan UCLA Medical Center opens its doors with a21st-century building that is both cutting edge and humane. Open spaces that include plazas, fountains and gardens surround the complex, which en­compasses Ronald Reagan UCLA Medical Center, Mattel Children’s Hospital UCLA and Stewart and Lynda Resnick Neuropsychiatric Hospital at UCLA. The exterior is clad in travertine marble that was imported from the same quarry in Tivoli, Italy, as the stone used for the Getty Center in Los Angeles. Outdoor terraces on the fourth and fifth floors enable patients to enjoy the open air and mountain views, encouraging therapeutic in­teraction in a beautiful environment. Inside, the design allows abundant natural sunlight. Even at more than 1-million square feet, with 23 acres of floor area and nearly 300,000 square feet of corridors, the overall feel of the building evokes several smaller hospitals instead of a single over­whelming structure. IT HIT WITH A JOLT AT 4:31 A.M. on January 17, 1994, and registered 6.7 on the Richter scale. Seventy-two people died in the Northridge earth­quake, thousands were injured and the shaking caused an estimated $12.5 billion in damage. UCLA Medical Center was among the dozen hos­pitals in the region that were significantly dam­aged by the quake. When it came time to consider how to respond to the damage, UCLA’s leadership em­barked on an ambitious mission to bring the fin­est in hospital technology and design to Los Ange­les. With $432 million in earthquake relief from the Federal Emergency Management Agency and $44 million from the State of California – and the groundwork laid for a philanthropic campaign that eventually would raise nearly $300 million in private donations, including a $150-million gift pledged in honor of Ronald Reagan by a group of prominent civic and cultural leaders – the Peis were brought in to conceive a facility that would marry the best ideas in design, medical science and patient care. The two-year planning process – from 1997 until the first shovel of dirt was turned on December 7, 1999, to begin what, at a cost of $830 million, would be the single-largest construc­tion project in the history of the University of California – included a series of focus groups that brought patients and their families together to talk about what they liked and disliked about the current hospital. More than 500 physicians, nurses and designers also were consulted, offer­ing their insight into how to execute a design that would ultimately best serve the patients. Meanwhile, I.M. and C.C. Pei spent hours atop an adjacent parking structure studying the site for the new building before visualizing a design. The result is a hospital that is functional but also beautiful and stylish. To adapt to the chang­ing needs of healthcare over the next century, the design team emphasized openness and flexibility, creating a technologically smart building with the capacity to be upgraded on an ongoing basis. And the building also is incredibly strong – perhaps one of the strongest public buildings in California. As one of the first hospitals built to the state’s strict new seismic-safety standards, Ronald Reagan UCLA Medical Center was con­structed to withstand an 8.0 earthquake and remain structurally sound and fully operational independent of outside resources for up to 72 hours. Literally a pillar of strength, its skeleton is a 26,000-ton web of steel – more than 17 times the amount found in the average office building. Each large-scale weld required about 20 hours to complete, double the time of a standard weld. 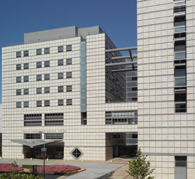 RONALD REAGAN UCLA MEDICAL CENTER opened its doors on June 29, 2008. “As we moved in the first patient, we realized … we’ve turned on the building and it’s on forever,” recalls Richard Azar, the director of transition planning. “It is a building that will never shut down.” Visitors entering the new building will im­mediately notice the sense of spaciousness, both in the public areas on the first floor and on the upper patient floors. They also will notice the natural light, which streams through the multi­tude of large windows – the hospital incorporates more than 80,000 square feet of window glass. 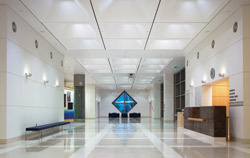 Light is a key element of the hospital’s design. “It really helps both patients and staff to be able to experience light from the outside world rather than artificial light,” says Azar. Other efficiencies go a long way toward im­proving patient care. 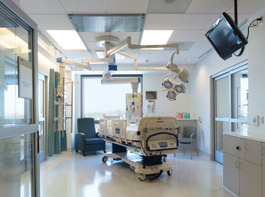 The 154 intensive-care beds, for example, are designed to allow caregivers 360-degree access to the patient. A movable overhead power column delivers electricity, essential gases and other necessary functions. Equally important at a facility that treats some of the sickest and most-complex patients, all rooms outside the ICU are equipped with out­lets and connections necessary to convert those rooms to ICU suites if necessary, reducing the need to transfer patients from one room to an­other. All patient rooms, except for a few on the Mattel Children’s Hospital UCLA floor, are private, and each provides space for family members to stay overnight in the room with their loved one. TECHNOLOGY NOTE YET INVENTED when plan­ning for the new hospital began is now woven into its fabric, giving clinicians new ways to monitor patients, fight disease, track information and survey patient progress. It includes wireless access to reports, lab results, clinical imaging and patient vital signs; audiovisual communica­tions; diagnostics; robotics; imaging systems; and advanced audio and high-resolution video-confer­encing capabilities. With both medical technology and informa­tion technology advancing at warp speed, the planning team was challenged to ensure that when the nearly decade-long construction pro­cess was complete, aspects of it wouldn’t already be out of date. Magnetic resonance, computerized technology and other equipment used for imaging and in the interventional catheter labs are huge pieces of machinery with a half-life of a few years. “You wouldn’t have wanted to select that equipment back in 1997 and be install­ing it in 2007,” says Dr. James B. Atkinson, chief of pediatric surgery and senior medical director of transition. Thus, in many cases both selection of the equipment and the building design around it were put off until the project was closer to completion. The state-of-the-art technology is promi­nently on display on the second floor, where the hospital’s 23 operating rooms and 17 interven­tional-procedure suites boast the most-advanced equipment available. Ronald Reagan UCLA Medical Center is also the only hospital in the world with a comprehensive neuroimaging unit immediately adjacent to, and integrated into, a neurosurgical ICU. On the sixth floor, the Single­ton Clinical Neuroimaging Research Center is equipped with state-of-the art brain-imaging devices (PET/CT scanner and 3.0 Tesla MRI scanner) to provide the highest level of care for patients with brain injury, stroke, hemorrhage from aneurysm rupture, brain tumors and epi­lepsy. The center also allows for unprecedented noninvasive neuroimaging research into the nature of neurological disorders. The new building includes a robust IT system with both wireless and wired connections and a single network through which all of the systems run. Data centers operate on different levels on opposite sides of the building to provide redun­dancy in case one goes down. Computers on carts are available in every patient room for clinicians, and every nursing area has multiple stations. 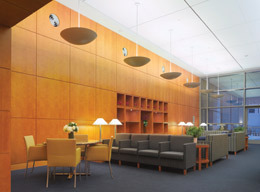 A SINGULAR GOAL was behind all of the archi­tectural and technological decisions: to provide a patient experience that emphasizes compassion and healing. Clustered in nursing-unit pods of 26 beds each around the perimeter of the building, the large, private patient rooms benefit from an abundance of natural light and a sense of plentiful space, with views through large windows that overlook gardens, green spaces and gathering places. Each includes a visitor’s nook so families can spend time in the room comfortably, without crowding the patient or interfering with care. The rooms come with residential-style furniture and a win­dow seat with a daybed that can be pulled out for sleeping. Family members and patients alike have Internet access, along with on-demand hotel-style meal service. There are no longer visiting hours – family members can be with their loved one 24 hours a day. One of the main conclusions to come out of the focus groups held with families and pa­tients was their desire for more privacy. Beyond the private rooms, the new hospital delivers in several other ways. Absent the traditional long corridors, patients no longer experience the bus­tling hallways with people walking by their door. Instead, the design minimizes foot traffic going past rooms. “Every ward is like a cul-de-sac off of the main circulation grid from the elevators,” Azar explains. Because they are far-more plentiful than in the previous hospital, there are now elevators for patients and visitors and separate “core” elevators for support staff. UCLA HAS BEEN A LEADER in patient care, medi­cal research and teaching for more than 50 years. Today, UCLA Health System physicians provide an array of cutting-edge and research-based pri­mary- and specialty-care services in four hospitals on two campuses, and in more than 75 clinic loca­tions. U.S.News & World Report has ranked UCLA Medical Center the No. 1 hospital in the western United States for the past 19 years, and the publi­cation’s 2008 survey ranked UCLA Medical Center among the top-three hospitals in the country. That was before the move. There are many reasons to believe that in Ronald Reagan UCLA Medical Center, the quality of care UCLA delivers will be even better, says Tod Barry, director of quality-management services. The most-obvious advantage comes from the shift to larger, single-occupancy rooms, he says. “The rate of hospital-acquired infections is a national concern,” Barry notes. “Certain infec­tions can jump from patient to patient even with the best hand-washing techniques. With private rooms, however, that risk should be dramatically lower.” The larger room size also means there will be decreased need to move patients within the facility for services that would otherwise re­quire more space. The ability to bring ICU-level monitoring capabilities to every patient bed also reduces the necessity of transferring many of the sickest patients. With computers available at every bedside, access to patient information will be at the point of care, lowering the likelihood of miscommunication among clinicians – the lead­ing cause of errors in U.S. hospitals, Barry says. A newly implemented electronic medication-management system using bar-coding technology reduces the risk of medication errors. “The new hospital will enhance our ability to deliver care safely, efficiently and with compas­sion,” asserts Dr. Feinberg. “And when you think about it from the patient’s perspective, that is by far the most-important thing. Patients don’t really care as much about fancy technology or the physical structure of the hospital. They want care that is effective and delivered in the most-humane way.” “The bottom line is that this hospital will markedly enhance the quality of care we deliver and enable us to continue doing what we do best,” adds Dr. Levey. As the opening in June of the new facility neared, he reflected on all of the people who rallied around the idea of a top-notch new hospital being built in Westwood, including the many donors whose generosity ultimately made the project possible. Dan Gordon is a regular contributor to UCLA Medicine.